I have a handicap plate. I use handicap parking when I need to, on bad days. Otherwise, I just park wherever I can find a spot. I figure, if I am having an ok day, save that spot for someone that needs it more. This blog will go hand in hand with a future blog called “You don’t look sick”. So, I pull into Walmart’s insane parking lot. There is not any point in the day or night that this parking lot is not a three ring circus with clowns everywhere. I just need milk and…I really am not feeling well. I park in a handicap spot close to the entrance. 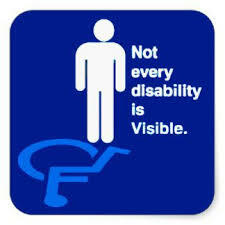 As I get out of my car, the elderly gentleman next to me glares at me as if to say “You aren’t handicap!” Why does this bother me so much? Why do I feel like I need to justify my medical condition to this person. I actually ordered a decal for my back window that read -” I do have a right to park here. I have Scleroderma. Never heard of it? Neither had I. Look it up.” But even then, why do I need to explain? I have often thought to myself that I should have a stock answer for when someone says something. But usually, there are no words, just an opinionated stare of disgust and disapproval. One time while I was still working, I was riding the elevator in the parking garage to the 2nd floor to my car. A very overweight man got on the elevator with me and when I pushed the button for the 2nd floor, he told me that I should be walking up the stairs not riding the elevator. I was floored that he had the cahones to say that to me. I very curtly replied, well, I have pulmonary fibrosis so the stairs are hard on my lungs. But really I wanted to say that PLUS F*@# YOU! I have learned to have a thicker skin (excuse the pun – you know…scleroderma…thick skin) and to use humor to deflect these type of rude people but I have to admit…it still gets to me. I thought I would blog about this to remind people that you never know what illness or struggle someone is fighting based on their looks. I look “healthy”, maybe even stunning some would say. haha! just kidding! By looking at me, you can’t see my hardening lungs, the mass in my brain, my narrowing blood vessels, the pain that radiates through my body every minute of every day, my paralyzed stomach attached to my feeding tube and many other things. So, please, the next time you see someone park in a handicap spot, or use a scooter chair to shop, don’t pass judgement on them. You never know what they are battling. And by the grace of God, be thankful that you are not in their situation. Wow! Today was deep! I had to go there! Sorry! But on the other hand, I am open to things I can say if confronted. I need a real zinger! Hit me up with some good ones! Thanks – I have faith in you guys!! Great blog! To be honest, I sometimes look at people who park in handicap spaces and get out of their car without a cane or a limp and I’m suspicious! Thank God, my brain actually starts working and I remember you, June and others I know who have life threatening physical problems but “look” healthy. It’s so easy to judge others even though we don’t know ANYTHING about them! OK. I’ll get off of my soap box (even though it’s true). Now, for some ways to deal with these people. 1. A good firm F&@?K you! is always a good one. 2. A punch to the mouth would very satisfying but unfortunately will get you arrested. 3. Ask them if they want to trade places. Not for the parking space but for your health. 4. Have printed cards with all of your ailments to hand out when confronted by these jackasses and continue on your way without saying anything. It’s bad enough you have to deal with so many physical challenges without the uninformed judgmental a-hole comments! I love your blogs and love you. You are amazing on so many levels! Keep up the good fight. You are doing more good for more people – sick or not – than you’ll ever know. Also you do it with humility, self-deprecating humor and in a non preaching manner. We’re so proud of you and so glad you’re part of our family! Do that stuff! Thank you so much again for the love and support! You know I will always be YOUR number one fan! Love you! Put a “Cure Scleroderma” decal on the back of the car. I know exactly what you are talking about. I’m thinking of asking my doctor if I should get a handicap permit because my Raynaud’s is so bad (and I don’t even want to talk about these knees!) but I’m not ready to deal with the public. Often when I tell people I have a chronic condition they say something like I look like I’m doing OK. Whatever. I want to just bite them. I hear you! If I had a dime for every time someone told me “Well you look great!”….I would be a very wealthy woman! We scleroderma sisters have to stick together…its good for the soul! Xoxo! You can always say, “what I have is not visible but is highly contagious and always deadly. Want a hug?” See how many hugs you collect! Agreed! I am completely nuts!!! Love you!! !